Family first//Ties/give some to those that needs help…..really i don’t know what i would do. I would go from rags to riches and would wipe the slate clean to start from scratch for a whole new spectrum if I win big. Before investing, pay off the debt with the million (after taxes figure 500K), student loans first, then the housing purchase assistance loans and then the mortgage. I dont need the car, so I’d sell that. I have the app so there should be the extra million for that. Invest whatever is left over from the lump sums after making a few important renovations to the house and donations to select organizations. Live off the 52K a year while the investments grow. I would definitely help some people that need it…. definitely the struggling mom’s………. Wow wow my girls I love them so much they deserve this more then anything…………. Wow…………They truly are my life……………miracle….. If I was to win,I would secure a home, car, Aba services ,health insurance, and college funds for My children and! And the rest, I would build a trust and or facilities,something, to help our special needs children and ,seniors citizen’s ! Struggling Mom with big dreams! First thing I’d do is get in my knees thanking my GREATER SPIRIT, for all he has done for me! Something that will never go away is a beautiful smile which I’ll will be wearing full time now and after a while then a house where I live live to be with my best friend and that is the RIVER! The River is my friend those that know me know that is where I want to be when it’s over for me ! Then the life I’ve never had will begin and imagine all the new friends as I go comeon let get down lest ROCK AND ROLL! PCH please pick me for all AMERICIA TO SEE, I’ve stayed and played from dusk till dawn and ordered and ordered and until the cows came home! This is where I want to be …. Dear PCH. Good morning I love to claim my entering to win this $10;000.00 Cash Prize plus $2.6 Million plus more PCHno 8800& 9216. Thanks PCH for this opportunity. For LIFE SUPERPRIZE Giveaway NO.8800. i would pay my bills.i support all financial needs of my family support the education of my son. If I won I xould pay all my bills. I could pay my hospital bills and get the collection agency off my back. Build a house, help family and the nede. I would be able to tithe to the church. And I would be the happiest girl in the whole USA. If I won I would pay all my bills. I have a large amount of hospital bills. I could pay them and get the collections agency off my back. Build a house and help family and the needed. I would tithe to the church. And I would be the happiest girl in the whole USA. I would pay off all my bills and share my winnings with my family and our church. Get my student loans paid off that I accumulated going back for my master’s degree and invest in some property! I would pay off all of my bills then I would have to think about it!!! Pay off my Texas then all my bill. By house.thank! I want to win it all so I can help family and friend!!! This will allow me to do so much good in this world . could do to prevent bullying. I would also go to the senior center see how I could get seniors legal help. the rest at our age we would enjoy a certain amount of freedom in our last years and we would like to help others do the the same . If I win it ALL, i’m going to give the Lord his 10% 1st, with a praise of thanking him for the blessing he has bestowed upon me. Then i’m going to bless my grandchildren by putting up funds for college. 3rd, i’m going to take care of my debts and help my family, the one that are in need of a breakthrough. I’m going to donate so much to children’s hospital, bless my children and put them some up for a rainy day, and bless others that are in need,only the poor and the needy though. I going to save some and enjoy life, like i’ve always dreamed of. I’m going to have my books publisher, bless my chuch, and be wise by giving and spending, because a fool and his money will soon part. I might don’t go in that order, but the 1st one will surely be honor;then, however the Lord leads me, that is what i’m going to do. But i am going to give back,when God blesses us he intented for us to do the same. If you keep your hands closed nothing goes out, but nothing comes in either. I would pay off debts and build a new house that has been my dream. If I win it ALL, 1st, i’m going to give the Lord his 10%, 2nd, i’m going to put up my grandchildren college funds, 3rd, i’m going to take care of my needs and my family, but only the ones that are in need. then, afterward, i’m going to bless the poor that are in need of food,clothes,and shelter. Iam NOT going to be no fool though, giving to everybody that says they are in need, no, but to whom is much given, much is required. i know how it feels to be in want and need when others have it, but will not share it. I would then donate to charity. I WOULD FIRST I WOULD CELEBRATE WITH AND HELP MY FAMILY WITH SOME OF THERE BILLS. THEN I WOULD REMODEL MY HOUSE AND GET NEW CEMENT IN THE DRIVE WAY. A month for life and brand new car. DEAR PCH, If I was to win the Dream Life Prize of $ 2 MILLION Cash. + $10,00 a Month for Life, and A Brand New Car, I would probably start BY yelling a big oooh doggie doggie OOOH DOGGIE DOGGIE , and then be crying for joy, and thanking Prize Patrol and giving hugs,and thanking GOD for me winning ,,and then get Family members and friends on short notice that I can and Prize Potrol and we all go and eat some BBQ,,,but after all that,, the most important thing would to be to start making plans to marry my soul mate in Hawaii, and pay off all our bills, and start looking for us our very own Log Cabin house ,,, then looking to start a small businesses,, oooh and I wont forget the Harley Davidson Motorcycle I hav always wanted,,.. and I will help out some family and friends,and just hav FUN FUN ….. I would love to win $2,000,000.00 and $10,000.00 a month for life. I could get out of debt by paying my house off and giving my family a better living enviroment than they have. Helping them with future education and what ever our maker brings my way. God Bless the person that will win. Peace to all the earth. Tomorrow is veteren day God bless the solders that lost there lives fighting for our freedom. It would be a blessing ,if I should win to help My 4 children and My 16 yr. old granddaughter and i could do some traveling. Thank You for the opportunity to enter and maybe win. h ank You and smile its healthy. Maureen. First thing pay off my debts,take a short vacation and build a new home. At 74 i hope my dreams come true. If I was to win such a prize, I would clear all my debts, then help my children. I would also give to my church to help those that are in need of food and shelter. Thank you PCH. I want to win it all!!! Pay off debts and take a short vacation. First of all I would be so excited, thanking PCH, laughing, crying, happy tears, the I’d go to my Bank, Pay off all my Bills, Look for a house, buy a new car, new clothes and then take a vacation. I would be so happy, it would take a while to be so finncially secure, never winning anything before like it. Then taking some friends too dinner. How lucky it would be if i were to win it all June 30th. I could travel, and help My 4 children and My 16year old granddaughter with Her schooling and My family of 3 half breothers and 3 half sisters. I omly vised Hawahionce 10 years ago and I would like to again and visit My heratage Irland it would be wonderful but I,ll have to wait and see. Thank You for the opportunityto enter and smile and have a nice day. Moe. At 74 it would be nice to pay off debts and build a new house. If I won,the first thing I would pay bills.Then use some money to buy a place for Homeless Veterans.Then buy a home for me an my family.Then help the rest of my family,cause I,m retired.Help put the Grandkids thru college,and save the rest for a rainy day. FIRST IF I WON I WOULD THANK PCH AND THANK GOD FOR THIS GREAT OPPORTUNITY AND PRAY TO GOD TO GUIDE MY STEPS SO I COULD BLESS MY WIFE SO I COULD BUY A HOUSE TO LIVE IN AND NOT RENT ANY MORE AND GET A TOMB STONE ON MY FATHER GRAVE SITE. AND HELP MY KIDS, AND TAKE A VACATION WITH MY FAMILY. AND HELP OTHERS. and there are many more I can not name it. me,I wil do everything I can to keep it going. If i win first thing pay off debts and later remodel my home. I would thank God for this miracle, Pay off all the monstrous debts, help my kids, go to a financial planner, set up a Foundation to help underprivileged kids get a great education and life, be involved in helping eliminate homelessness and actually have a life. How wonderful that would be!!! I ameant here again ,I hope my entery was fast enough to qualify. I am so very happy and I thank GOD for this opportunity to continue to entereceive in these PCH Prizes,and again I thank you. I believe the first thing I’d do is pay off the mortgage. I’d like to help our children with their college debts or their mortgage debt. We live in a older home and needs a lot of repairs to bring them up to date. We love the country life. All those homeless veterans and wounded veterans need to believe that others do care and would help them. Make it possible for those that are homeless and hungry to have a place to eat and have shelter. I’d also like to take a nice vacation to Alaska where one of my twins lives and hasn’t seen for years due to health problems. I’d like for my spouse and I to be able to travel and enjoy life and to see the beauty of this great country that we live in. Be able to enjoy life more while we’re around yet. We love this country in which we live in. I would pay off my mortgage, pay off my bills. Go on a vacation for the first time in my life, instead of working and always having the burden of who is going to get to get their payment. Would love to be able help my family and friends. Life would be sooooooooooo grand. If I am lucky enough to win it all, it sure would make my life much easier. I’d pay off bills, by a house and have a new car to put in the driveway. I would also help the people who have helped me through ruff times. Also everyone one who know I had won with all the noise at my door. Buy a house, invest in my family. If I win the first thing I would do is to help my children and me next and a new puppy. It would be a blessing to win it all at PCH. The money, car, and cash would be a help for the needy and maybe a treat for me. I would do the best I can to help others. First I’d get stabilized then I would set about starting a foundation to help others. Oh what a blessing it would be. I would help my son get a home, get myself a tiny home by some water, help some of my very close friends. One friend in particular! Help my X husband, fix my car, do some traveling,donate, move out of my place and find a nicer place or just move. To win is to be able to breathe,relax, retire, try to live a quiet , healthier lifestyle, eat the right foods that I would be able to afford. $16.00 on food stamps can’t buy you healthy food. Veggies and fruits. I can finally retire from being a Substitute Teacher of 43+ yrs. I’m tired of doing it here. I don’t want to see life pass me by. I want to be part of life ! I am retired, so no chance of me going back! Both my wife and I have been married before and merged our two famlies together as on our car the children then wrote “Just Married the Geiger family”! So the Geiger family will be called together for a meeting on how they will fit into the money part of this great game. At that time my wife and I have all ready have an agreemeet BUT we feel they should have some in put to see if their are any needs or changes that they would like. Boy that should be interesting! After as we live in different states, we will have a few days at some vacation resort and enjoy each other! What a pleasnt time we should have I hope this will not turn into a DAY DREAM, we all hope that We have a chance at this dream. Thank you PCH for giving us at least a Dream! Set up a trust fund for my children and grand children and build a new church in Jackson. Pay off all my bills then help others in need. Betty Anderson,When the Prize Patrol gets here with a big HELLO and thank them for the Prize that I will never forget Then I don’t want to forget All the people at publisher clearing to make this all possible. Yes I will gas up that new car and head for a vacation. money in a safe place until we get home . there is so many places the money could be real help. our church is first then the disable veterans then the childrens hosp,then we need some for our next vacation. Thanks a million for making this possible !! First I would praise the lord for answering my prayers!!! I’d take 1/2 of it and pay off taxes and give give the rest of it to charity (wounded warriors), or kids at Christmas. What ever is left will help family members and retire. 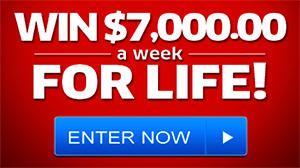 It would be such a load off if I were to win the 2 million plus 10K every week for life. I have been out of work for quite some time and I am currently unable to find a job in the field of sleep and this would take a great burden off. I would be able to help my parents out as they are well into there 80’s and I could help them with a place to live and get the care they require. Once I got everything taken care of that needed to get done, I could afford to go on a very long relaxing vacation. Maybe Jamaica!!! I’D HELP THE HOMELESS SINGLE MOM AND HER FAMILY OF TWO KIDS GET THEM A HOME IN THE STATE THAT HAS THE LEAST TAX ON PEOPLE GIVE KIDS COLLAGE FUND AND A TRUST FUND SO WHEN THERE DONE IN COLLAGE THEY WILL HAVE SOMETHING,FOR ME I’D BUY ME SOME TIME BEFOR I GO AND LEAVE THE REST IN A TRUST TO HELP THOSE UNFORTUNET PEOPLE WHO CANT GET ENOUGH MONEY TO BUY A HOME GOD BLESS ALL AROUND US AND BRING HUNGER TO A STOP HELP SOMEONE AN ANGELE IS WHATCHING. If I could win….I would be very thankful and praise to God for this wonderful gift, and to the PCH group that has made it possible for me to win I would be grateful for them eternally. There are several special people I would want to help to get started in a business that would help them financially. My children need help and of course my church would appreciate having some help. Whatever happens I know it is God will and not mine and I will be very thankful for this gift. 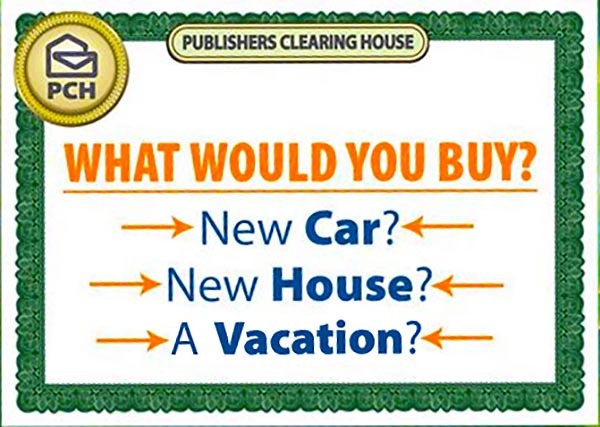 If I won PCH Win it all sweepstakes. The first thing that I would do would be to notify SSI that I no longer need to be humiliated by having to try and survive on living two times below the poverty line and being treated as poorly by someone as they do. Then I would buy a house and set up a scholarship fund for each of my grandchildren. So that they have a chance to achieve all of their dreams and goals in life. Then I would try to seek out other people who would like to become a part of establishing a support fund to provide a way for those who suddenly find themselves disabled opportunities to still be able to be a viable productive part of society. That would allow them to maintain their dignity and not be treated as less than human. By not only providing them with a way to continue earning a decent living but provide them with a support group that will help with the emotional and psychological adjustments that you go through accepting the new life you have to live. Thus allowing them to have a strong self-worth meaningful reason to keep living and improving their standard of life. I would like to win pay off debts and build a new home. the veterans and children who are in need of health care or surgery. Also help the needy who are less fortunate . First I would tithe. Then I would get the $80,000.00 Hep C treatment. Then my specialist would put me on the list for a transplant for my lungs. Then I’d move to an arid climate so my current/new lungs would have the best opportunity to work without all the meds and such. Then I’d give my boys a bit of money STILL FOR SCHOOL…no matter how old they are they will go to at least a trade school for their trade so they can rise the ladder to success. Then I’d have a spa WEEK TO BEAT ALLLL Others. Good things comes to those who wait and GOD keeps His promises. Be a nice retirement package to give me frredom to do things ive not done !! First of all, I think I would faint. Then buy a new home, a new car, and help my family. Help the hunger and the homeless. I HOPE TO WIN! Lin Appling … FOR MY FAMILY! Win it all would pay off some debts and build a new home give away 8800. !-I would like to say THANK YOU to PCH STAFF & TEAM for your hard work and many hours spent, making PEOPLE DREAM COME TRUE. 1) I want to WIN IT ALL. 2) Do a brain storm meeting with my wife and I. Then we can move into our dream Future………………..
Likely, I’d cry with joy, and say a prayer of thanks. Then, I would thank Publishers Clearing House Reps in no small way. First I would pay all my bills. Then, I would take out dental insurance on myself and my husband. My kids need help with some problems, so I would help them get the things my grandkids need. Last, but not least, I would give money to St. Jude, the only Hospital that helped my parents when my little Brother was dying of cancer. After all the former items were paid for, I would buy a new car and repair my storm damages on our house. I would then love to see all my family members united at one big party! I would pay my bills, take out Dental Insurance Policy on my self and my husband, repair storm damages on my home, and keep my promise to give money to St. Jude Children’s Hospital in Nashville, Tenn. because they were the only ones who tried to save my little Brother when he had cancer and my parents ran out of money to afford treatment for him. After that I would help my daughter and the rest of my family with their needs. Hola queridos felicito a todas aquellas personas que de una manero u otra han obtenido algun premio y de manera especial aquellas que son madres tambien a las que trabajan en la compania a todas las personas les deseo un feliz dia de las madres y agradeciendo a DIOS por poder disfrutar este dia que es simbolico por que dia de las Madres son todos los dias.Gracias PCH por tanta oportunidad.Dios Bendiga America.LC Hialeah.Gracias. If I won $2,000.000.00 plus $10,000.00 plus a car #8800 or any other amount I would thank God for the blessing. I would thank PCH for being so kind and sweet. I would use it wisely by paying off my bills. I made some bad decisions at a young age. I would pay off my student loans speedily. I would bless my church, I would first pay tithes and offerings.My church help a lot of people. I would purchase a home closer to my family. I work with special need children. I would give to St. Jude. They really help so many families. I would help my siblings. I would pray and get guidance on how to manage or invest. I already take a class for that at my church. Thank you PCH for every given chance to win. I would love to win the 8800 $2million lump sum how do I receive my number to win. First thing I’m going to do is buy my mom and tombstone for her gave, then make sure my brothers and sister are taken care of then I’m buy a house for me. Then I’m open up some business plus build a church.amen! 1st , pick myself off the floor, help my family and some very close friends, pay bills! Then retire from being a Substitute Teacher of 43+ yrs. Travel, paint till my hearts content. Be able to finally breathe! Maybe this time around is my luck to win it all. 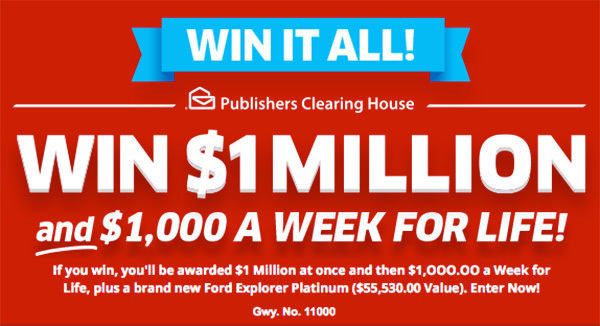 Pch Gwy # 8800 to win it all on June 30th ! I would drive in my new car to a grocery store and pick some people to pay their grocery bill anonymous then drive to a toy store and buy toys for the children who don’t have that privilege. And soo much more!! Tide with all the churches in my community. have a better life and help other !!! I will help the people as much as I can. I would first pay off my bills, second buy me a small home, and then help my children and grandchildren if they were in need of help. I would help pay my granchildrens college tuition and finally endow two scholarhips that I am now paying to fully endow. First I would thank God. Then I’d repay my debts. I would establish a foundation to help those in need investing in relief and opportunity for the disadvantaged. or win it all! on June 30th 2017 . I never won any sweepstakes in my life. EVERY TIME I REPLY THEY DELETE IT. I WANT TO WIN I HAVE BIG FAMILY AND WANT TO HELP THEM ALL OUT. I HAVE NOT SAID THAT BEFORE. SHOW ME. I WIN I’LL FALL DOWN ,HUG ,CRY AND CALL EVERYONE OVER . TO PINCH ME TO SEE IF I’M DREAMING. I would build me a home so that nobody could tell me what I can do with it. Then pay off my bills make sure I get all my medicine I need because it’s hard choosing between one month to the next what do do without food or meds. Of course I would for sure help my parents and my sister and her family. Security yeah that’s what I want in my life. It would be a great birthday present this year. May 25 the is my b-day. I’m disabled and I live on less than 7,000.00 a year. So with GOD’S blessing maybe it will be me as the winner. Thank you GOD for entering me in this sweep stake. The first thing I would do is get myself out of debt. Then I would do the same for all my family. Then I would help anyone I know, or am acquainted with. Lastly, I would hire a financial advisor to advise me how to invest and/or use the rest. With the help of God, I would like to win. I would take care of mu family with ALL their NEEDS. Then I would get a financial advisor to help me to use, invest, etc. and at the same time take of my needs and my everything. Thank you God and Publishers Clearing House sweep stakes for entering me in this game. PCH WIN IT ALL $ 2 MILLION PLUS Brand NEW CAR.